Adriana is the Founder and CEO of Girls in Tech (GIT), the world’s first group focusing on Millennial women in technology and entrepreneurship. She created GIT in 2007 because of a crucial need she lacked herself at that time in her tech career - a support framework to help women advance their careers in STEM fields. Adriana has worked with or alongside tech companies like Indiegogo and change.org, served as advisor for Involver (Oracle), is a Singularity University Impact Fellow Scholarship Recipient, and has had key executive roles at Ogilvy & Mather, Interpublic Group of Companies and SecondMarket. WITH GROUPS CREATING PROGRAMS TO ENCOURAGE FEMALES TO CONSIDER STEM, WHAT IS THE BIGGEST BARRIER TO ENTRY THAT IS STILL PREVALENT TODAY? I think the barrier to entry to create the actual programs is pretty low. Like startups, it’s easier than ever, and more cost-effective than ever, to create something from scratch. As far as the barriers to entry for the programs to actually succeed, that’s another story. You have to find the right subject matter experts, and you need to be able to measure your success to see if you’re making an impact. But we’ve found that women actually flock to these types of programs—they’re in very high demand. My parents! My Dad was in tech and my Mom was a scrappy entrepreneur. They both instilled the values of entrepreneurship within me. And even today, I go to them regularly for mentorship and guidance; they are my biggest supporters. WHAT IS YOUR PROUDEST MOMENT/ACCOMPLISHMENT? The first Catalyst Conference, in 2015. It was a big deal because we pulled it off with such a small team and so few resources. It was our first major conference, bringing speakers, partners, and so many women in STEM together. To see that kind of energy in the room and to witness the impact we have on women, first hand, was incredible. 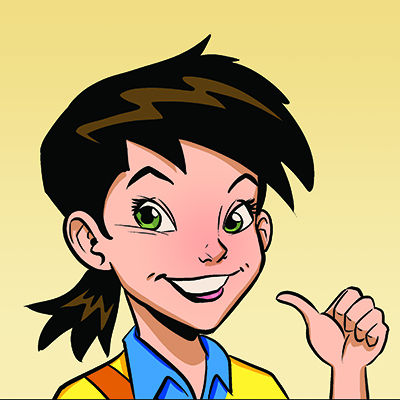 Ella the Engineer is a cartoon series to encourage young kids, specifically girls, to pursue careers in coding, science, engineering, arts and entrepreneurship. All rights reserved Ella Adventures, LLC.